Right in the center of the Floridas Gold Coast midway to Palm Beach and Miami is Fort Lauderdale Beach. Tropic Cay Beach Hotel is one of Fort Lauderdale Hotels located on the scenic beachfront roadway overlooking the blue waters of the Atlantic Ocean with white sandy Beach tall palm trees and the famous Fort Lauderdale golden Sunshine.Tropic Cay Beach Hotel is a great place with great rates for beach front accommodations and a sunny vacation. Our Fort Lauderdale Hotel features accommodation choices of Standard Rooms or Kitchenettes Efficiencies.Whether your vacation to Fort Lauderdale Beach is for a few days of fun - a few weeks of sun or just an overnight stay -The Tropic Cay Hotel is the perfect location in Fort Lauderdale Beach. 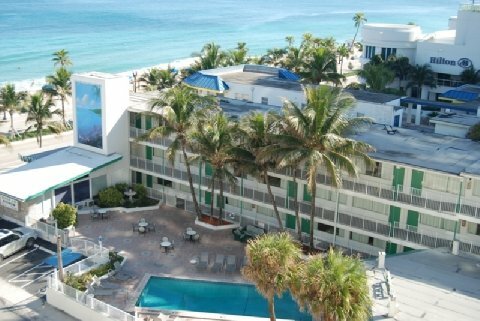 As one of the few Fort Lauderdale Hotels overlooking the beach The Tropic Cay Hotel is centrally and conveniently located close to all Fort Lauderdales major attractions.Make your Reservation at The Tropic Cay Hotel for a Sun filled Vacation in Fort Lauderdale Beach.